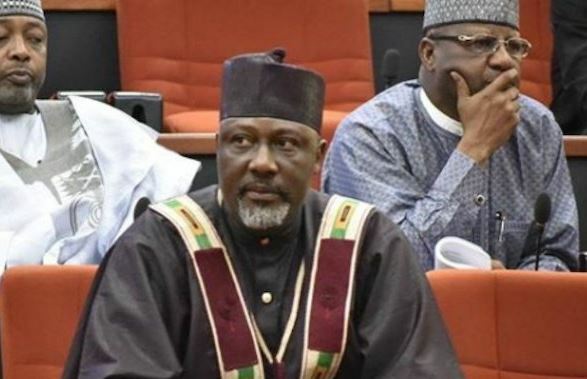 A Kogi High Court sitting in Lokoja on Wednesday granted bail to Dino Melaye standing trial over alleged criminal conspiracy, illegal possession and dealing in firearms. The trial judge and Chief Judge of the State, Justice Nasir Ajanah, said he granted the accused bail due to his ill health. Ajanah said that from the documentary evidence proffered in the case filed by his counsel, Chief Mike Ozekhome, there was no doubt that the accused was suffering from some kind of ailment. “In addition to the asthma, which the third defendant (Melaye) was alleged to be suffering from, the last medical examination shows him to have what is referred to as ‘Soft tissue trauma and stress related hypertension. “I consider this health situation to be a special circumstance entitling the third defendant to the discretion of this court in admitting him to bail. “In the circumstance of this case and in the light of the documentary evidence and the state of health of the 3rd Defendant, I am convinced that he is not likely to evade his trial,” the judge said. Ajanah said that he believed that at this stage, the prosecution had concluded its investigation and attention should be paid more to the expeditious prosecution of the main case. He, therefore, granted bail to Melaye in the sum of N10 million and one surety in like sum. He said the surety must be a person of means and shall so depose to an affidavit of means with verifiable address. Ozekhome, while pleading for bail to his client, had sought a declaration that he was arraigned on a stretcher before the Lokoja Senior Magistrates’ Court. Ozekhome claimed that Melaye was asthmatic and suffered cervical spine and leg injury in respect of which he was still receiving treatment at the National Hospital, Abuja. He also urged the court to declare that keeping him in police custody would seriously jeopardize his health condition and also render it impossible for him to satisfy the bail conditions earlier granted him by another court in Abuja. The prosecuting counsel, Dr Alex Izinyon opposed the bail application in a 23-paragraph counter-affidavit. Izinyon claimed that the accused did not have any outstanding medical problem except a malaria attack. Izinyon added that the genesis and revelation of the claim was Ozekhome’s afterthought. In his defence, Ozekhome said there was no counter document from the prosecution on the medical document obtained from the National Hospital on Melaye. “If you feel the man was not sick, why will the prosecution move Melaye from a medical centre to a more renowned hospital with better medical facilities,” he said. He said the law provided that the court had the jurisdiction to grant bail to the defendant in exceptional cases like ill-health even if the case attracted capital punishment.